wiSLA generates a special MOS (Mean Opinion Score) test that imitates a real voice session between a couple of wiProbe probes in your network. Available parameters are codec type, voice traffic bitrate, voice frame length. Check service quality statistics, faults list and analyze all SLA violation cases. wiSLA allows to monitor service quality in each direction with microsecond accuracy. Manage traffic routing with Quality Based Routing (QBR) function. wiSLA switches real-service traffic from loaded main channel to the alternative one in case of its sufficient capacity. wiDPI function allows to define the most active users and applications utilizing your single connection and entire network. Analyze band utilization in directions and make a correct decision in case of network development. Set up corporate quality policies, monitor services on SLA, expose penalties to your partners for inappropriate quality services. Download applications for Android or iOS and get near real-time information about status services, network bugs, network maintenance, service quality changes statistics. The system can collect service quality information from Cisco, Juniper, RAD, Eltex, Metrotek, Huawei, OneAccess equipment. Additional metrics can be collected from equipment management system. Monitor available VPN capacity and Internet links according to the schedule or on-demand without impact on customer services. Imitate user actions from the allocated offices and monitor application quality. Use the online quality metrics monitor with customized up-dating period. Use SNMP-trap, REST API, SOAP, SMTP to integrate your customer support systems, SMDB and LDAP. 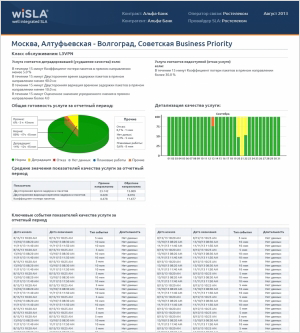 Interfaces can be available to your partners via Partner Gateway to coordinate maintenance schedule, information exchange about service quality degradation and SLA reports to calculate SLA penalties automatically. Add unique fields for services and access points. Use tags for easy search and list classification. wiSLA notifies on quality degradation and SLA violation cases in accordance flexibly build-up notification setting and logical event handling. Check the quality service information for any period and choose the safer partner. 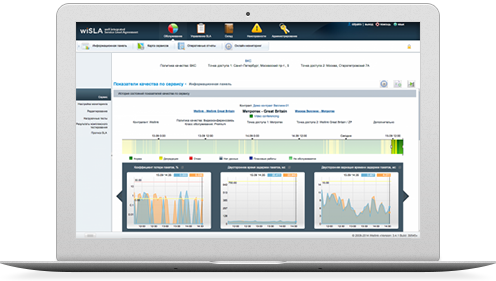 The system generates reports based on the same ITU-T, TM FORUM, MEF, IEFT and RFC standards that your service provider use. Customers and Provider access the secured data about service quality. Service quality statistics of the previous period . wiSLA allows to launch new service monitoring in 1 one minute due to automatic probe configuration.